Why does Seville Spain attract so many world travellers? Seville is a city in southern Spain, and the largest city in the Andalusia region, located on the Guadalquivir River. Seville is a beautiful city, known for its diverse culture, the beautiful monuments and unique architecture, and the heritage that is found here. With plenty of things to do in Seville and much to see and experience, this wonderful city will charm anyone who visits. Whether you’re interested in seeing cathedrals (the third largest in the world can be found in Seville! 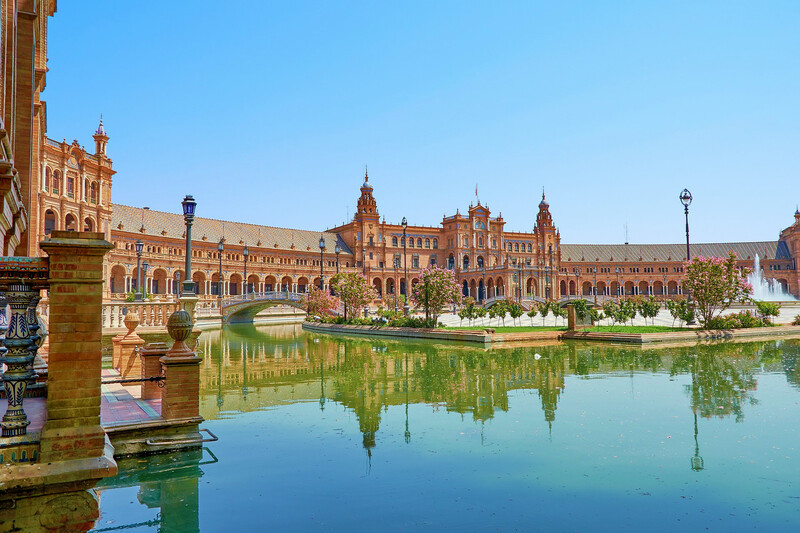 ), checking out a bullfighting ring, or you’re just interested in taking a slow walk down one of the sunlit streets full of life and the scent of freshly cooked food, orange blossom trees, and breathtaking scenery, Seville is a wonderful place to visit. Please click on our buttons below for more guides on visiting the city including popular Seville restaurants, and a selection of the best Seville hotels. Seville is located in Southern Spain, located roughly around fifty miles from the Atlantic Ocean. Seville is the capital of the region of Andalusia. Seville’s beautiful architecture and buildings will draw the eye of anyone visiting the city. The Seville Cathedral, which is the third largest cathedral in the world, is located here, which includes the stunning Giralda Tower. Also, you can’t forget about the Reales Alcázares of Seville, which is a royal palace built in the 1600’s, complete with a lush garden with a pond, fruit trees, and flowers. The weather in Seville is a Mediterranean climate, being one of the warmest cities located in Europe. The average temperature in Seville is about 18 degrees Celsius (about 65 degrees Fahrenheit). Summer temperatures are can reach up to 40 degrees Celsius (about 104 degrees Fahrenheit). Winters are also relatively mild, as well, with temperatures usually staying somewhere between 4 and 14 degrees Celsius (about 40 and 57 degrees Fahrenheit). Most of the rain in Seville occurs during the winter months. There are several ways to get to Seville, including by plane, with the airport for Seville being the San Pablo Airport. Another way to get to Seville is by train, with the Santa Justa Train Station being the main station to serve the Seville area. The metro and tram are also options, as it arriving via roadway. For a little extra something special, you can take a cruise ship and arrive right in the downtown area of Seville! Seville is a wonderful area for tourists, with plenty of places for those who want to explore the city to stay. There are many beautiful hotels and vacation homes that has simply breathtaking architecture, such as Boutique Hotel Casa del Poeta, Corral del Ray, and the Hotel Las Casas de El Arenal. Seville also has several bed and breakfast type hotels that will offer families and couples a more personal feel. Seville has plenty of opportunities to explore and learn new things about the area. Depending on the time of year you plan your visit, you might find yourself fortunate enough to catch a festival or a Flamenco show! Also, you can take a ride on Sevelle’s panoramic wheel, which will give you a great new way to check out the city from different heights. Check out some of the famous buildings in the city and experience the stunning architecture the city is famous for. Various art shows and museums are also in Seville, and who can resist a romantic moonlit stroll down one of Seville’s quiet, atmospheric streets, lined with gorgeous flowers and trees? Seville is a wonderful tourist spot, and has something for everyone.